The shop keepers of Azam Cloth market pride themselves on, and they like to stress this vehemently, being a part of ‘the biggest cloth market in Asia.” While snaking your way through the many winding alleys lined with shops of various sizes you do tend to lose track of both time and space. The market is a collage of many small interlinked bazaars where the daylight doesn’t always seep in and the damp musty odor of history prevails. 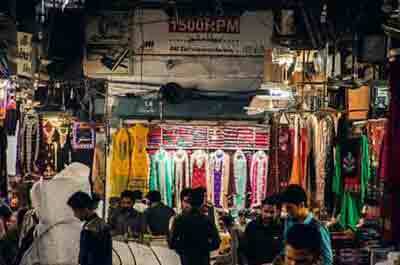 Situated in the walled city of Lahore near the famous Rang Mahal and Shah Alam markets, the Azam cloth market is the hub that has been handling wholesale distribution of cloth and ready-to-wear for the last six decades. From khaddar to silk, ready-to-wear to clothing fabrics, casual wear to bridal wear, the market has something for every apparel retailer. 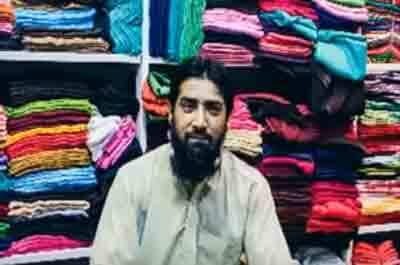 According to Mohd Amjad Sheikh, who has been in the wholesale apparel business since 1974, the Azam cloth market caters to a wide customer base both in Pakistan and abroad. “Retailers from all over Pakistan, Dubai, and the UK visit us for their stock purchases. The merchants of the market are well versed in the history of the place. Every shopkeeper can recount how when the market was created and named. There was a small market near Wazir Khan Mosque; in 1953 when a road had to be widened the market was shifted to its current location by General Azam who gave his own name to the market. Over the decades, the small market extended and now has numerous interlinked blocks or bazaars all dealing in wholesaling of various types of clothing fabrics and lines. How many interlinked bazaars are there in the market? There is no consensus as such but gathering from the comments of various shop owners the number must be somewhere between 15 and 20. Fire extinguishers, security guards and clean roads show an active involvement of the board that runs on a self-help basis. Every shop owner pays monthly charges of about 200-300 rupees to form a combined pool that helps meet the maintenance expenses. While it is difficult to explore every bazaar in a single visit, every first-time visitor should stroll in the Nawab bazaar to get a feel of the place. 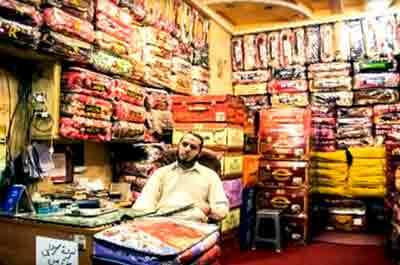 Nawab bazaar is the first and the oldest block of Azam cloth market. Its open cool spaces invite the customers to linger and shop at their own pace. The shop owners are friendly and there is an overall ambiance of good cheer. Two different versions prevail in the market about the history of block’s name. One interesting story traces origins of the name to the first generation of businessmen who started their businesses in this market. According to this version, this first generation of wholesalers liked to arrive late in the markets and opened their shops around noon. So people started calling them nawabs (nawab connotes a laid-back almost royal attitude) and the market came to be known as Nawab bazaar. 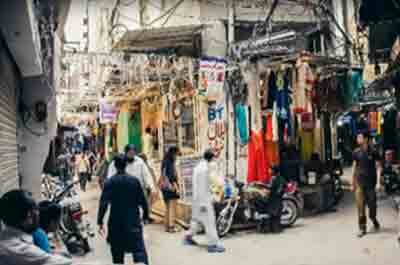 Javed sahib, the president of Nawab bazaar, however, strongly disagrees: “My, father, Haji Nawab Deen, was the first generation of wholesalers who established businesses in this block, and the bazaar is named after my father,” he states. Whatever the real history of the name, the different versions add to the aura of antiquity surrounding the market. The wholesale business is dominated by men. Not only there are no female shop owners but you rarely encounter female customers. Occasionally you can run into a lone female retailer traversing the narrow alleys of the market. 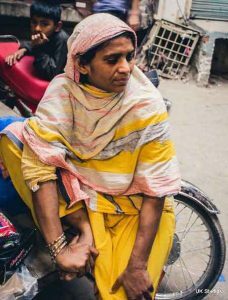 Razia is one such brave woman I met while combing through the glittering, colorful shops of women’s apparel. Whether you are a retailer, a casual visitor, or a customer who wants to get good bargains, try heading for the market between 9:30 am to 10:30 am. This is the time when the traffic is not too heavy and it is still quiet in the throbbing, congested lanes of the market. Visiting the market early will save you half of the hassle of long traffic jams. The other half, while going back, you will have to bear. Another advantage of visiting the market early is that once you are there you can shop at leisure and will even have time to haggle with the shop keepers. As the day advances the business activity picks up the pace, the market gets too crowded. Parking your vehicle is now easy as there is a huge parking plaza near the market. However, the plaza doesn’t have a lift and once you park the car you will have to walk all the way down and then walk all the way up to get the car. It is a bit of exertion and would help if you are in the mood for some exercise.